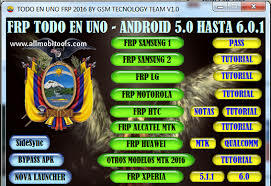 The TODO EN 1 FRP Remover Tool is available here our Web Page and it is download free from at the end of this post for its official download link.If you want to install this latest tool on your android smartphones then don't worry just click the above download button given below of the post.After clicking the right download link and easily download the TODO EN1 FRP Remover Tool only a few seconds. The TODO EN 1 FRP Remover Tool is only the awesome tool available here our Website and download free of cost. With the help of this latest and amazing tool you can easily sole your android device any problems.It is and innovated and advanced tool that allows you to remove the factory reset protection options so, that is enabled in all recent android smartphones.The TODO EN 1 FRP Remover Tool is one of the most downloaded and popular tool that helps all android smartphones users to Remove FRP Lock from his android devices.Here we can shared the latest tool which will give you the best performance of your android devices.Click the link given below the post and manually download the TODO EN 1 FRP Remover Tool only a few seconds.The tool has been released with its more unique features which we can also discussed here our page. Here is the list of different keywords as under. Download TODO EN 1 FRP Software.